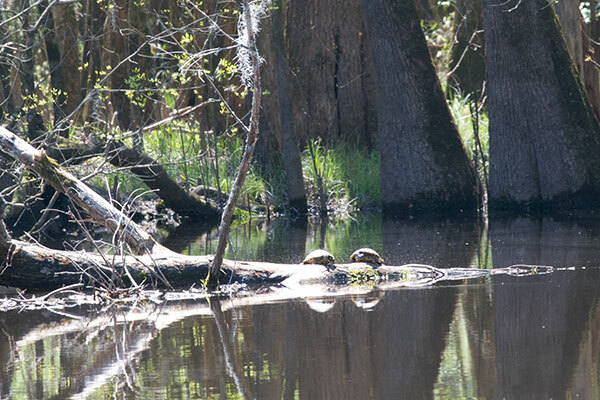 My wife Monica spotted this large basking turtle twenty feet or so off the trail. I would have tried to get closer for a decent picture, but (A) I would have had to go hip-deep in swamp water; (B) the turtle would have slipped away when it heard me splashing; and (C) the several large alligators in the area might have come by to see what all the commotion was about. 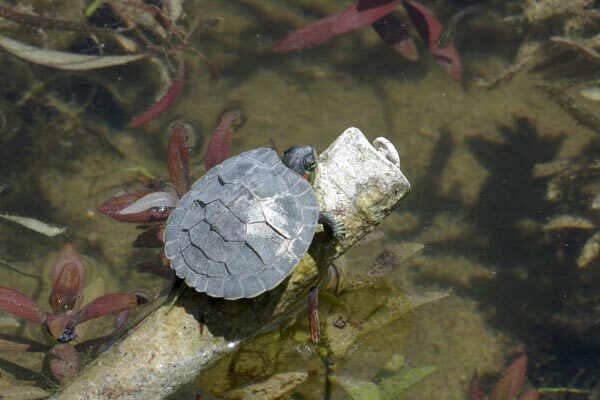 Young red-eared sliders like this one are very popular in the pet trade. 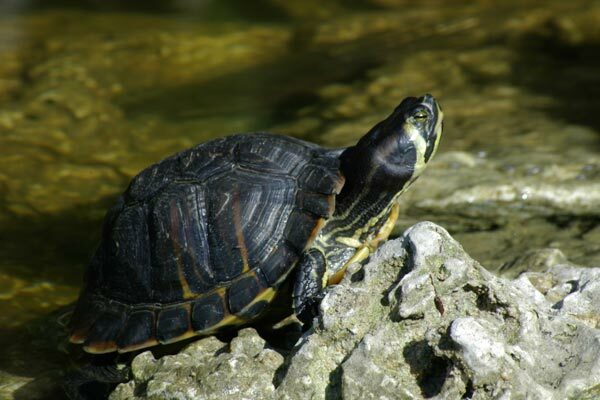 Unfortunately, large adult red-eared sliders are not so popular, and they commonly get dumped into ponds, lakes, and canals around the country and indeed the world. They aren't native to Florida, but there are plenty of them living there now. Here's a perfectly native thank-you-very-much red-eared slider basking in the amazing beauty of Sam Houston Jones State Park. We explored the Creole Loop in southern Louisiana on a cool spring day. It was too cool for the squamates, but the chelonians and crocodilians found it warm enough for some comfy canal-side basking. 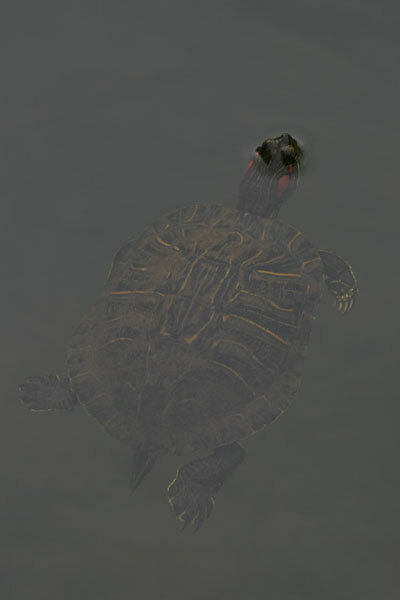 It's not always easy to distinguish distant turtles, but when I magnify the original photo as much as possible, I can faintly see the red patches on this one's head. A few minutes after seeing my first-ever Oklahoma herp, my wife pointed out this turtle and a couple of others. 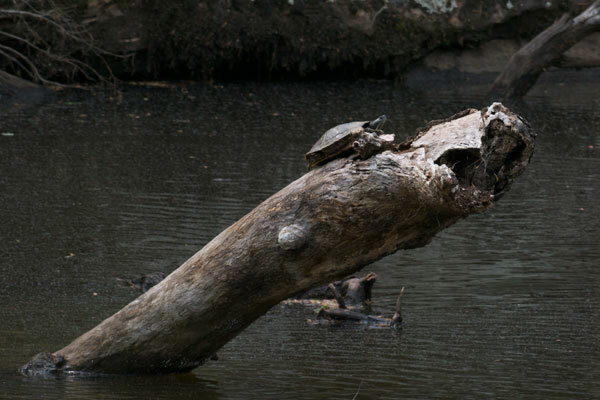 The other two stayed on the bottom of the murky-watered stream, and might have been some other kind of turtle, but I'll never know. 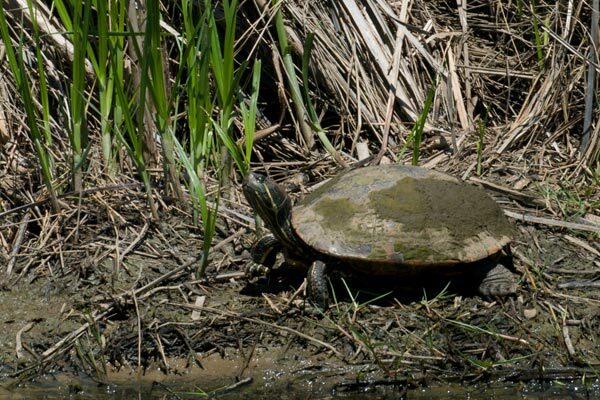 This one is without doubt a Red-eared Slider. Here's a healthy adult with a relatively clean shell. This youngish turtle was relatively brave, allowing me to creep to within a few feet for this closeup. 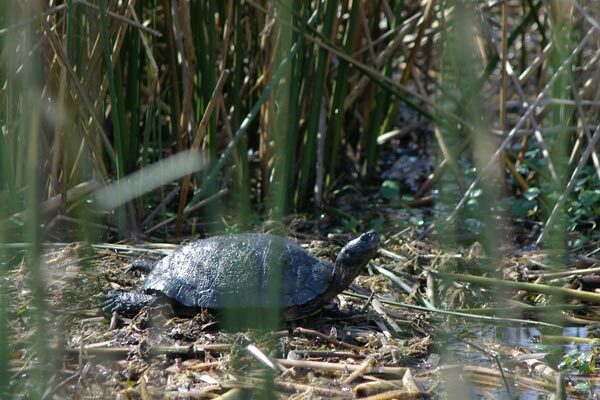 I had originally identified this as a Florida Red-bellied Cooter. 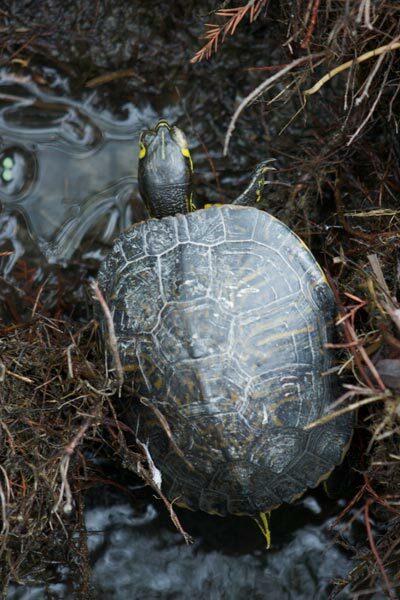 Mark Johnson wrote to point out that the large yellow ear patch identified this young fellow as T. s. scripta instead. 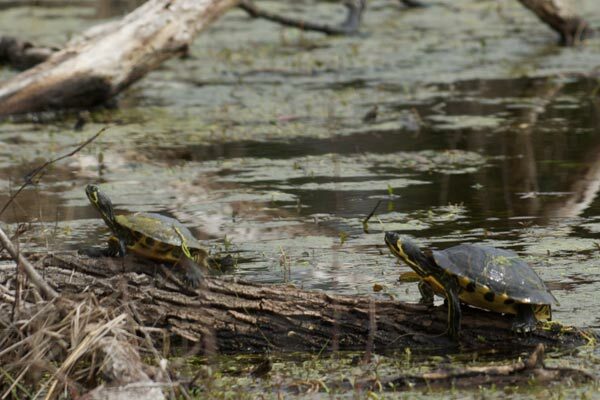 These turtles aren't native to South Florida, but neither are most of the other herps you run across there. 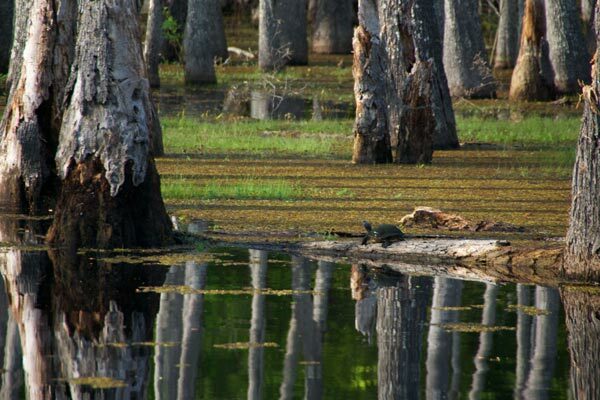 Pettigrew State Park is a large park that includes the impressive Lake Phelps. We visited it only for an hour or so to give our dogs their morning walk, and since it was a cool morning we didn't see any of the various exciting snakes that are common in the area. We did see quite a few turtles, but most of them were extremely wary and wouldn't let me approach for photos. This one was directly below a wooden overlook, so I guess it didn't see me looming above. Cape Hatteras National Seashore is on North Carolina's Outer Banks, a series of barrier islands that serve to protect the mainland from the harsh Atlantic ocean weather. 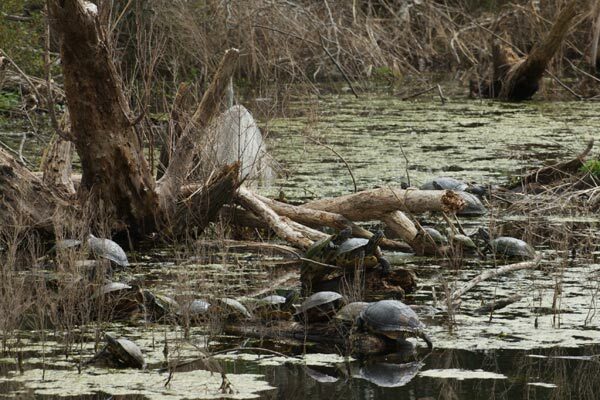 The area also serves as home for an astounding number of turtles. We Californians are just not used to seeing so many turtles. There might be multiple species mixed together in some of the large aggregations, but I believe at least most of them are yellow-bellied sliders. 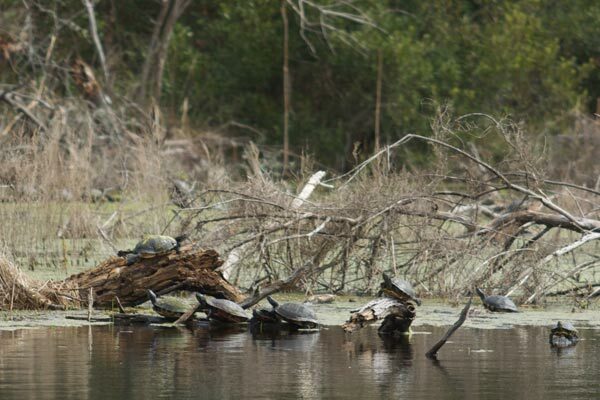 Here's one more picture of these turtles from the Outer Banks. There were about twice this many on the shore a few seconds before I took the photo, but as I mentioned above they are quite skittish. 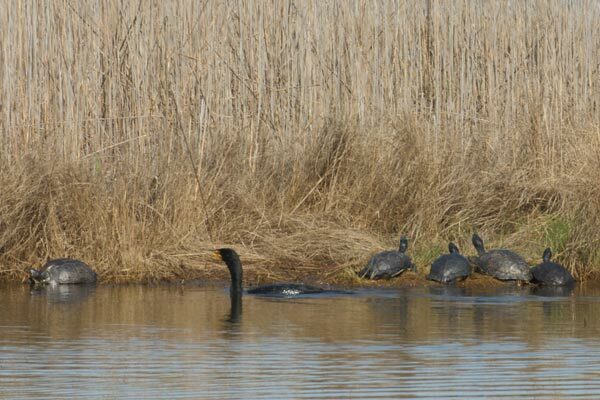 The cormorant drifting by didn't bother them, but my camera from the other side of the pond certainly did. 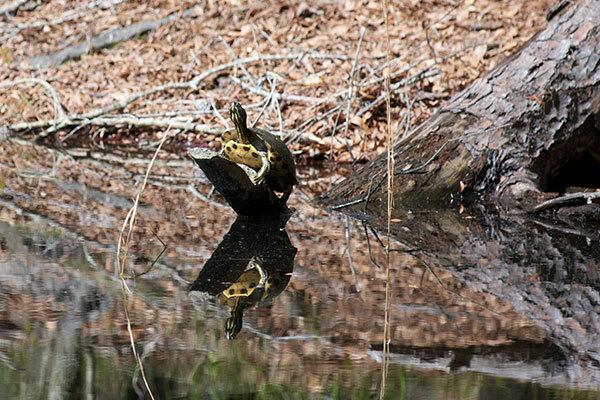 These two distant turtles were waving their legs about jerkily in some sort of awkward dance. A close look at the photo revealed that the dance was inspired by thick clouds of flying insects. 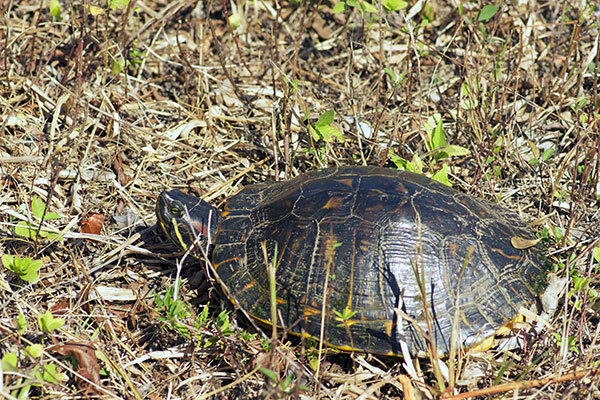 This was the only turtle I saw in this pond at Santee State Park, but at least it looked like two turtles from a distance.